About Us: An inspiration to serve the Philippines one person at a time moves USSC. We believe in bringing innovative ideas, products and services to advance the lives of all hardworking Filipinos. The company was founded in 1958 as Radio Communications of the Philippines, Inc. or RCPI. Over the past 60 years, the company has evolved from a telegraph company to one of the largest one-stop service shops in the country, the USSC Service Store. Since then USSC has grown to over 700 strategically located company-owned stations with an engagement of over 900 key-sub agent locations. Today, our commitment is stronger than ever; to serve, to help and to inspire. For us, this means making a difference in every Filipino through what we do. We take pride in doing everything we do, listening to and anticipating our customer needs in order to ensure that every USSC Service Store experience is both meaningful and positive. The USSC Panalo Wallet Alkansya is an electronic wallet which can be used to save cash in pesos or in dollars. It is also kept safe and secure by a fingerprint verification and validation process via our biometric scanner. For more information, click here. The USSC Cash Master is the modern way to carry and use your money. Sign up for a USSC Cash Master in any USSC Service Store and you're all set to enjoy the benefits of a safe and convenient way to carry and keep large amounts of cash in your pocket. No bank account required. No minimum balance. With USSC Cash Master, you can withdraw money from virtually any ATM in the Philippines and abroad. You may also use it to pay for purchases in any establishment carrying the Mastercard logo. Loading is so convenient, too. 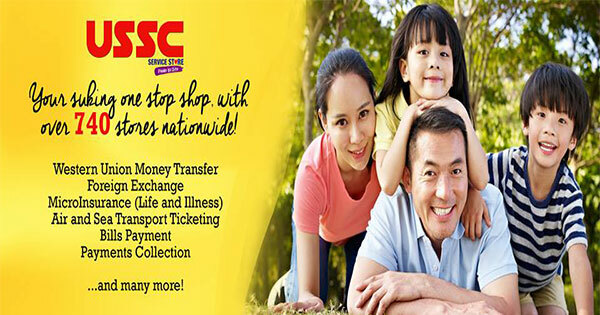 Go to any USSC Service Store location in the Philippines to top up your balance. That's over 700 branches for your convenience! Western Union is the leading international money remittance company in the world. The USSC-Western Union tie-up makes all inbound international money transfers from Western Union available in over 1,600 company-operated and sub-agent locations nationwide. Overseas contract workers or Filipino expatriates can simply send money via any Western Union office in the country of their employment and their families can immediately claim their remittance in the Philippines via USSC and its sub-agents in either Philippine Pesos or US Dollars. Domestic and international tickets for major airlines like Cebu Pacific, Philippine Airlines, Air Asia, Jetstar, Delta, Cathay Pacific, Eva Air, and Singapore Airlines, among others, are available in selected USSC Service Stores nationwide. 2GO and Super Cat sea line tickets are also available in selected USSC Service Stores. USSC Service Stores' strategic nationwide locations make them ideal for other service companies to use the outlets as collection centers for their monthly bills. Today, USSC Service Stores accept payments for Meralco, VECO, Davao Light and Power, Bayantel, PLDT, Smart, Globe, Express Telecom, Sky Cable, Sun Cable, Sky Internet, Philamlife, Maynilad, Manila Water, Digitel, SSS, and many more merchants. Need to top-up your prepaid load to keep your cellular phone running? Almost all USSC Service Stores carry the electronic loading service for major telecom players like Smart, Globe, and Sun cellular. PIN-based loads for major internet and gaming providers are also available. LifeGuard provides a 30-day P100,000 accident insurance coverage for people who want extra protection when they travel and commute. Dengue Rx is an insurance service which reimburses medical and hospitalization expenses associated with the treatment of a covered individual who gets infected with dengue. Maximum coverage is pegged at P30,000. For more information, please click here. OFWGuard is a loss of income insurance for the OFW. For more information, please click here. Domestic Package Delivery: Customers can enjoy convenience and savings every time they need to send packages and documents to friends, business associates, and loved ones almost anywhere in the country through 2GO's economical Quikpac pouch delivery. The 2GO service offers customers the flexibility of choosing their mode of delivery to be either store-to-store or store-to-door. International package delivery is also available via 2GO and FEDEX. Domestic and International Long Distance and Fax Services are available in selected USSC stores.